Exclusive. Spectacular. Inimitable. These are but a few of the words that describe living at the Long Cove Club. Although it is one of the smallest private communities on Hilton Head, its amenity package is unsurpassed. From the Pete Dye designed golf course to its boating and tennis facilities Long Cove Club is the epitome of luxury living. With that in mind, prices for Long Cove Club real estate and associated POA fees fall in the upper price tiers. The homes within this gated community feature views of Broad Creek, marshes, lagoons, woodlands, and the golf course. Since Long Cove is a small community, there are no distinct divisions or neighborhoods within the plantation. In total there are 569 full-size, single-family homes all approved by a strict architectural review board. Most homes have a view of a lagoon, marsh, golf course or Broad Creek. The community was designed around a unique “club” concept rather than the traditional structure of other residential plantations on Hilton Head. Membership in the club is automatic with each property purchase. All members must pay the same assessment covering use of all of the amenities regardless of property values or residency status. Tennis – Private racquet club with eight clay courts. Marina – Private – Boat docks and a small private marina on Broad Creek are accessible to property owners. Boat slips are available free of charge at Long Coves’ private marina. Floating docks accommodate up to 100 boats. Boating and fishing are available on Broad Creek and in the lagoons. In total, over 60 acres are available for fishing. Swimming – at the Clubhouse. Clubhouse – Overlooking the golf course the antebellum-style club house includes a tastefully designed dining room, lounge, pro shop, locker rooms, terraces and porches. The golf club is member owned with membership only through property ownership. 18-hole private Golf Course, designed by the renowned Pete Dye. It has been named one of the “Top 100” Golf Courses in America for overall design and excellence by Golf Digest. It is often ranked Number #1 in South Carolina. The national and international rankings for this classic facility are evident the first time that you play the course. It is the site of a USGA Mid-Amateur Championship and the caliber of course design by Pete Dye is evident. While lying along wetlands and marsh, it often projects a flavor of Scotland. Water is a constant reality check and shot placement is essential. Long Cove is clearly a shot maker’s course and demands long and strategic tee shots on the par 4`s and par 5`s. The physical beauty of the course and its diverse characteristics ranging from marsh to moss-draped oaks… to stands of pine and effective placement of love grass and long rough, combine to make it one of the world’s finest. 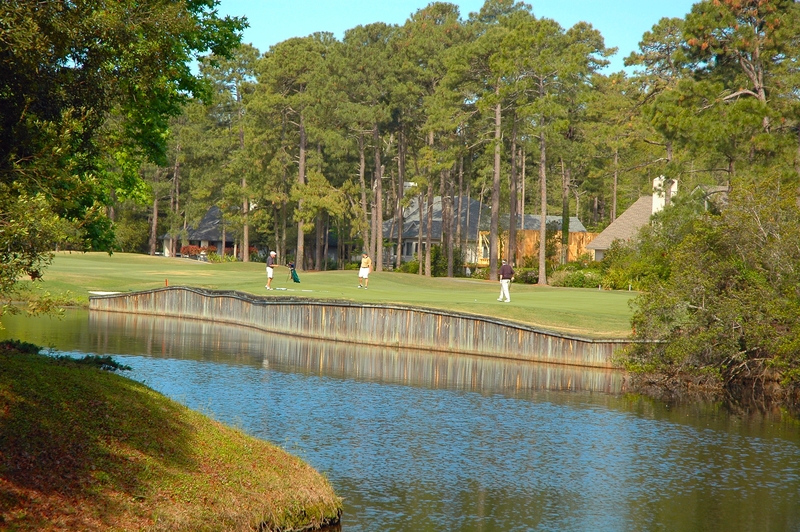 Located near the south end of Hilton Head, Long Cove is a private golf community where membership is required. The course is highly acclaimed and, to an avid golfer, a strong consideration when searching for a primary residence or second home. Although there are no beaches within Long Cove, they are a short distance away. This area is very convenient to shopping and restaurants. Long Cove also has a very active tennis community.